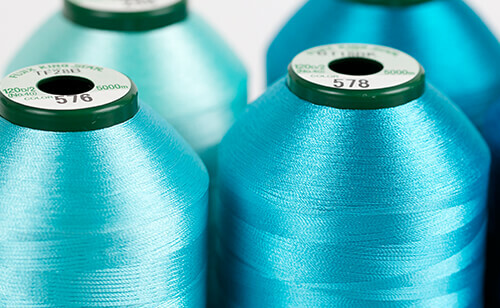 Britain’s leading independent supplier of industrial sewing thread for the UK, European and world-wide markets. We have large stock holdings of the following threads: SomaBond Bonded Nylon, Linen, Polyester, Polyester Cotton and Embroidery Threads. Next day delivery available on many items. Somac launched the SomaBond bonded nylon brand in October 2016 using the most up to date manufacturing methods producing a top quality bonded nylon thread. Suitable for companies producing bedding, upholstery, mattresses, carpets, industrial filters, shoes and many more. Click here to go straight to our online embroidery shop where you will find Kingstar® Polyester and Royal® Rayon Machine Embroidery Thread, Vilene® backing, Peggy’s® Stitch Erasers, and many other embroidery accessories. Next day delivery available on many items.